The second Xtreme Sports Games will be held on April 1, with 14 companies set to take part and six spots still available for new entrants, with registration to close on February 25. The event will be held at the National Sports Centre’s North Field from 11.00am to 6.00pm, hosted by Bermemes and featuring music, local food vendors, and more. Participating companies so far include JLT Insurance competing for Friends of Hospice; Artex competing for Coalition for the Protection of Children; Freisenbruch Meyer Group competing for Big Brothers & Big Sisters; HSBC Team 1 competing for The Family Center; Marsh Management competing for Womern’s Resource Cener; Ironshore Insurance Ltd competing for Bermuda Cancer & Health; AON Group Bermuda competing for Age Concern; KPMG competing for Centre Against Abuse; Oil Group of Companies competing for SCARS; Endurance competing for a group to be determined; SunLife Financial competing for B.A.S.E. ; Butterfield Bank competing for Bermuda Education Network; BAS Group of Companies competing for Tomorrow’s Voices; and HSBC Team 2 competing for The Reading Clinic. 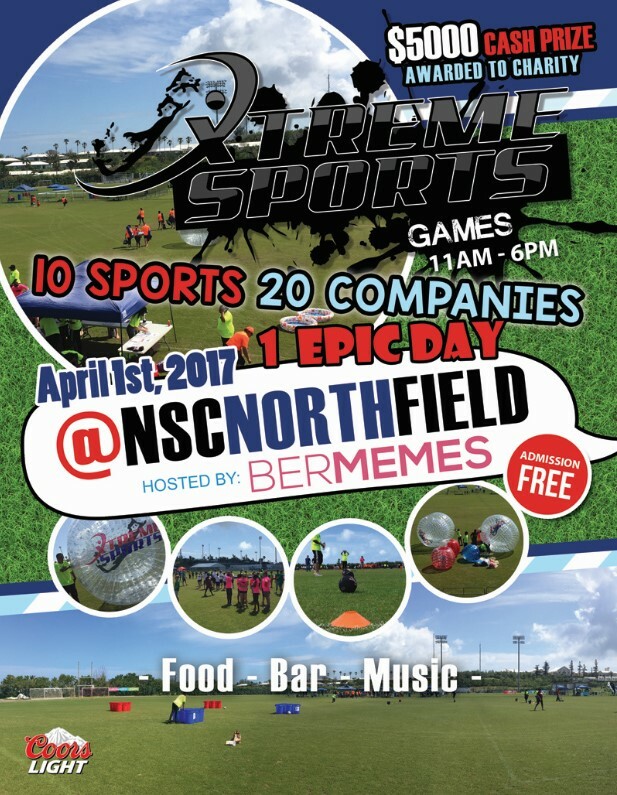 Company owner Marquel Waldron said, “I’m very excited to have 14 teams registered to compete in the Xtreme Sports Games 2017. As with last year, the business community as a whole have shown great interest in the event and for that I am very grateful. “Without the interest from some of Bermuda’s largest companies, the event will not be the success that it is. We’re very pleased to have some new companies register this year, and we’re just as pleased that some companies have decided to register again this year. “We’re also extremely happy to see that some new charities will be supported this year, and we hope to get this year’s supported charities more involved. “Unfortunately, the defending champions Anchor Invement Management will not be participating this year; but, this will make way for a new Xtreme Sports Games champion this year!